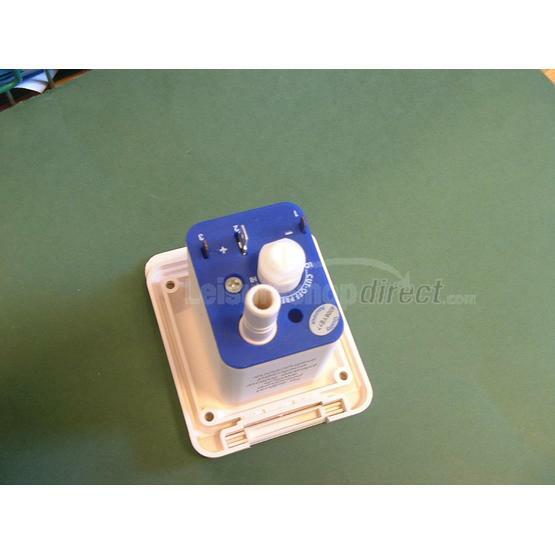 Spare Whale watermaster inlet socket with pressure switch. this socket has three male spade connectors for the connecting cables. 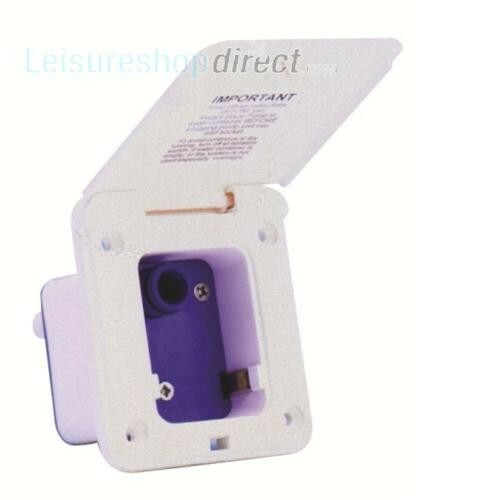 Ideal for use on pressurised system where there are no microswitches in the water taps. I have bought a 2001 Burstner Ventana 480TK and while it has sinks and taps and plumbing for a water tank, the plumbing and pump is too short to fit in my water rolling-style fresh water tank. The existing pump/plumbing sits in a hatch on the side of the caravan I presume normally has a portable water inside. Would you have information on such things (it looks like the tank may have been an accessory on this model when new) or a product that would suit our needs? Thanks in advance. This arrangement was generally unsatisfactory as the water supply was very limited. It may be best to remove the tank that fits into the hatch and fit a Whale Watermaster socket, ref. 127861 , into the side of the caravan and use a submersible pump ref. 127854 that will drop into your water carrier. The normal one fitted into caravans is the ES1001, our ref 127861. This is the water inlet fitted into the side wall of the caravan with combined pressure switch. 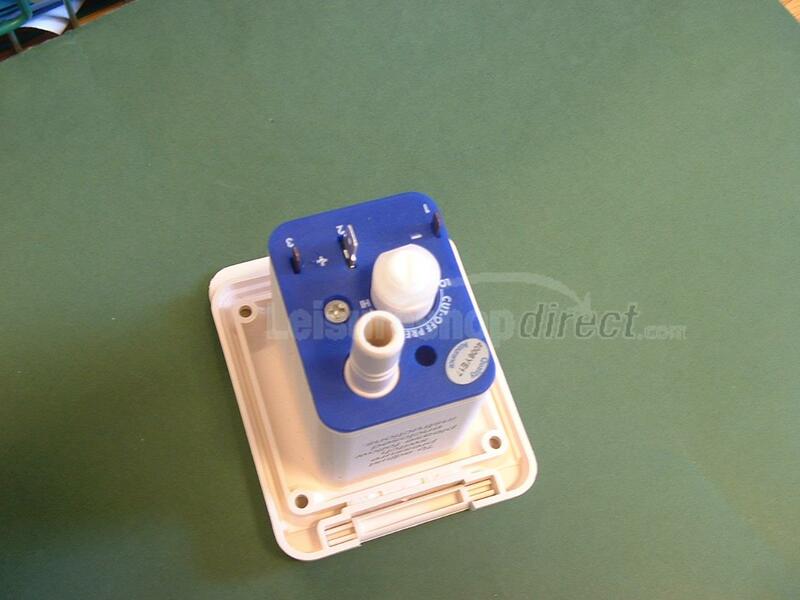 If you wish to fit an in-line pressure switch then this is our part 105500. This is a problem with the pressure switch that controls the pump. If you have a Whale Watermaster inlet then the screw to adjust the pressure switch is on the back of the inlet fitting. If you have a Truma crystal inlet then the pressure switch, probably our part 105500, will be in the pipework, normally fairly close to the inlet. To adjust the pressure switch you should first undo the adjusting screw as far as possible without removing it from the threaded hole. Then open one of your cold taps. If the pump starts then there is a problem with the pressure switch and you may need to replace it or dismantle and fit a service kit. When you open the tap the pump should not start, and then you gradually screw the adjuster clockwise until the pump starts. Close the tap and the pump should stop. If the pump does not stop then a quarter to half turn anticlockwise should be sufficient. Operate a tap again a few times to ensure that the pump operates correctly and some minor adjustment may be required at the adjusting screw to prevent the pressure switch 'clicking'. Very easy to remove existing socket noting colours of cables to refit with clipped water pipe to new Whale Watermaster Socket - ES1001. Arrived quickly and enabled me to solve problem of smashed cover and hinge with new socket to match magnolia/ivory colour of caravan and existing socket. The Whale water socket was easy to fit and solved my problem. Delivery was very fast and your price was very competitive. Received item in very good time. Price was very good. Geuine product but was ivory and not white as in the picture my fault for not checking . Purchased as the original had developed problems due to the cold winter, also the flap had come off . Still to be fitted but good service.